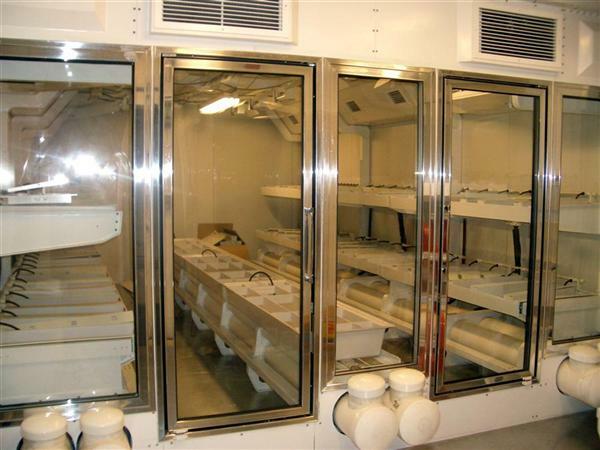 Above is the food growth chamber as assembled at Pole at the end of May 2004 (photo courtesy of Glen Kinoshita, one of the 2004 NOAA crew--see his site for a link to the full sized view). Two thirds of the 14'x28' facility (what is visible through the glass here) is the "production room" with an enhanced CO2 atmosphere, wall-to-wall growing tanks, and water- cooled sodium lighting which provide approximately 1/3 of full sun intensity. 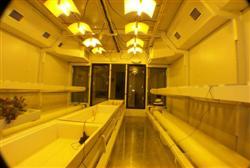 The rest of the unit (this side of the glass) is an "enviro-room" with enhanced humidity and a few "recreational" growth tanks. Along one side of the unit on the exterior is the electrical equipment, nutrient tanks, and controls...when completed, this facility includes a webcam as well as remote web-based monitoring and control instrumentation. The main growing room has sliding-drawer type tanks which are normally slid out to occupy the aisles; this maximizes the square footage available under the lights. The facility was developed at the University of Arizona...their old photos of the fabrication have disappeared, but they still have this web site on the project. At right is another view from the back of the production room; this photo from Phil Sadler was taken during the testing phases in Tucson. W/o's have experimented with winter gardens since 1957, when Paul Siple tried hydroponics. He had success keeping a philodendron alive all winter, but the edible crops suffered from molds and fungi. They determined that this contamination came from spores and similar particles found in the water supply from the snow mine. 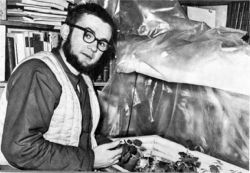 In 1960-61, Carl Hamner of UCLA brought bean plants, as well as cockroaches and hamsters, in the first serious biological experiment (the project failed to detect any geographical effects on "biological clocks." At left, aurora researcher David Sylvester tends some of the leftover bean plants during the 1961 winter). The Biomed facility in the dome was designed to support similar science projects which never came about. Elsewhere during the early years of the domed station, informal green-thumb efforts continued, using both hydroponics equipment and imported soil. The first use of a dedicated building came about during the 1990 winter (so far as I know) when a former paint locker was converted to take advantage of the then-abundant electrical power. Phil Sadler became more involved in the early 90s when some equipment was prefabbed at McMurdo for use during the 1992 winter. By this time, electrical power was starting to become an issue again (already). Still, the permanent structure on the annex roof was constructed during the 1994-95 summer and placed in limited operation that winter.